Hello old and new friends! If you just ventured over from The Vintage Bucket, welcome! 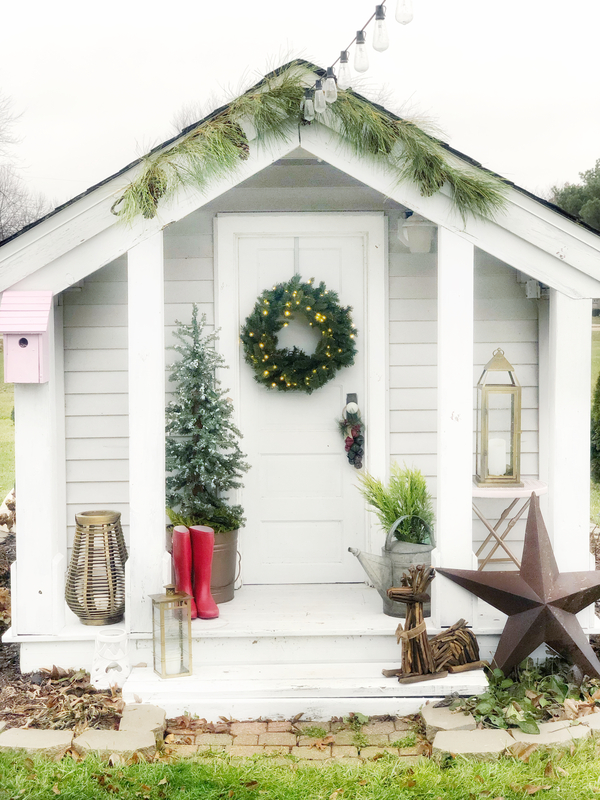 I’m so happy you popped on over for a cozy tour of my She Shed. 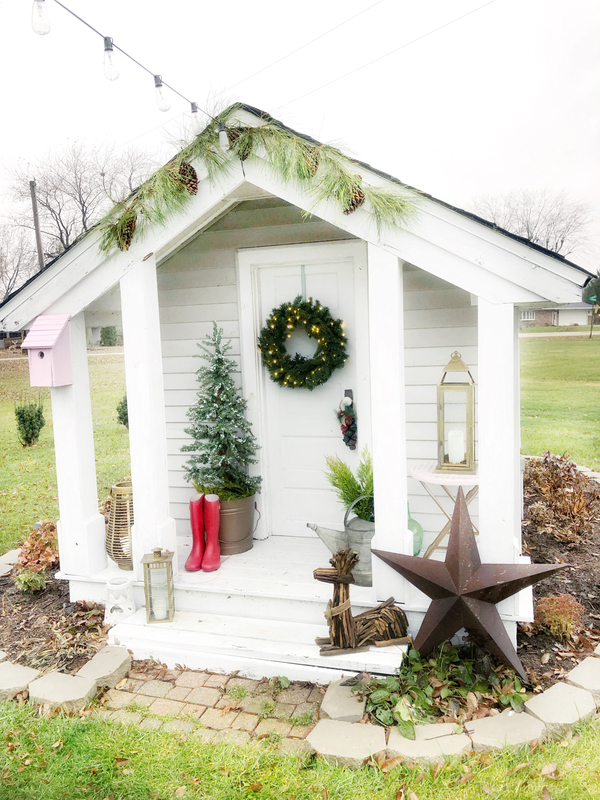 When I decided to re-purpose our three daughters’ playhouse last spring, I wasn’t thinking ahead. I hadn’t even pondered how fun it would be to decorate it for the holidays. At the time, I was just happy to clean it up, and give it some love. Unveiling it’s true charm has brought me more J O Y than I ever expected. 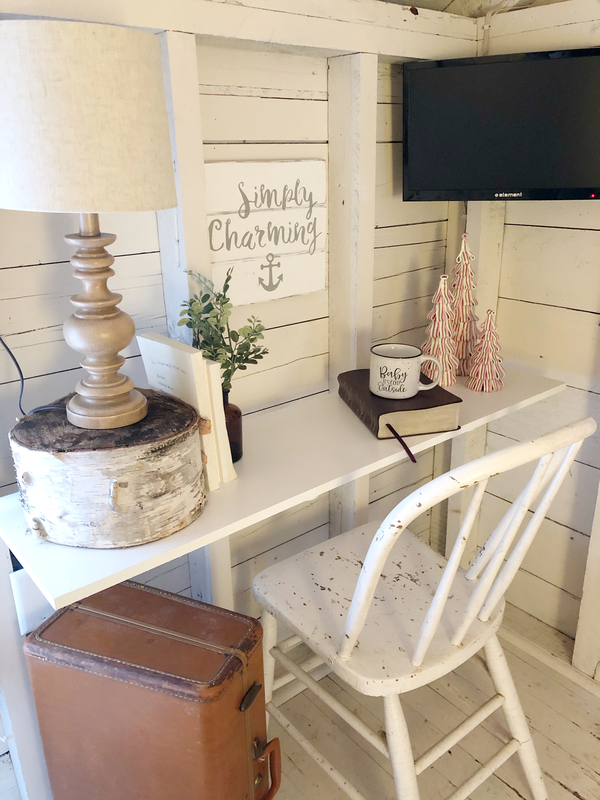 What once housed a tiny kitchen and busy little hands, now proudly envelopes a cozy sanctuary with just enough room for 2 to cozy up and binge watch Netflix. 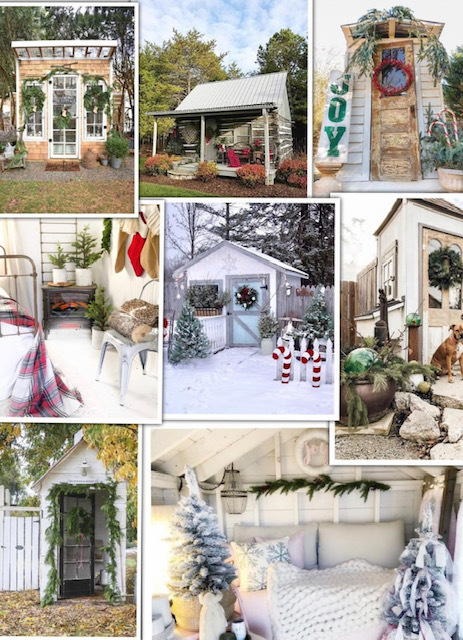 Sure, dressing her up for Halloween was fun, but bringing Christmas cozy in the She Shed brings a whole new level of splendor. This year, I added to my Christmas tree collection with a few 3 ft. flocked pre-lit trees from King of Christmas. I absolutely love our 9ft. Prince Flock Pencil Tree in the house, and these smaller trees are just as exquisite. 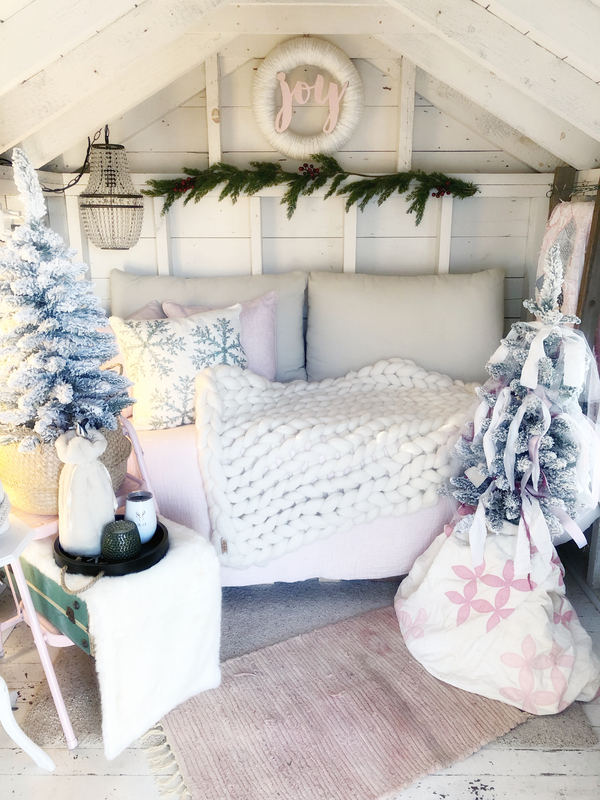 I followed the same tips I used in the house when adding extra cozy this time of year. You can check out that post here. The only thing still lacking is the perfect area rug, but I’m determined to find one. For now, I just have a scrap piece of carpet and a smaller rug layered. See that quilt wrapped around the tree on the right? My mom just recently gave that to me, no telling how old it is. I absolutely adore treasures like that. There’s another old quilt I have hung on the ladder, and I almost love it even more because it shows it’s age. There are lots of rips and tears, but it’s oh so soft. I crafted that garland draped around the tree on the right for Valentine’s Day a couple years ago when those garlands were the hot item. It may be a pain to unravel it without damaging it or the tree, but it sure looks dainty for now. 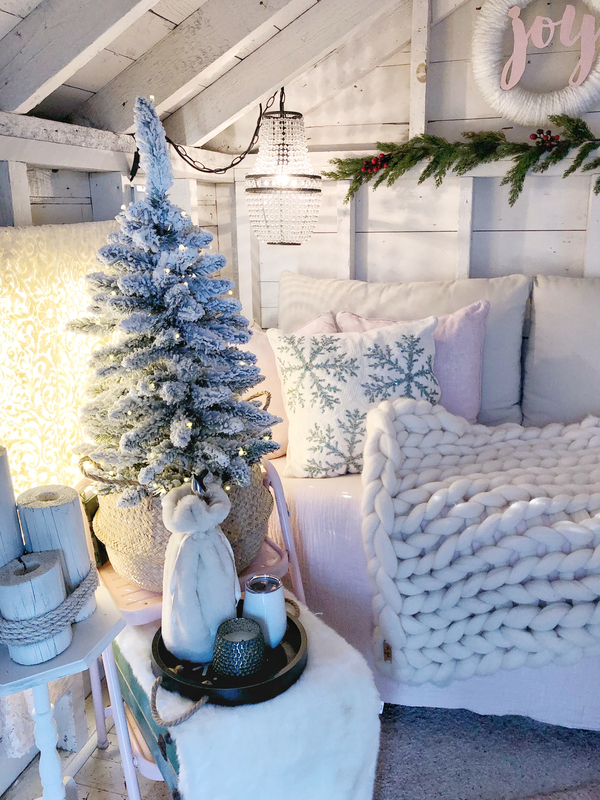 Nothing says cozy quite like a chunky knit throw and twinkly lights. 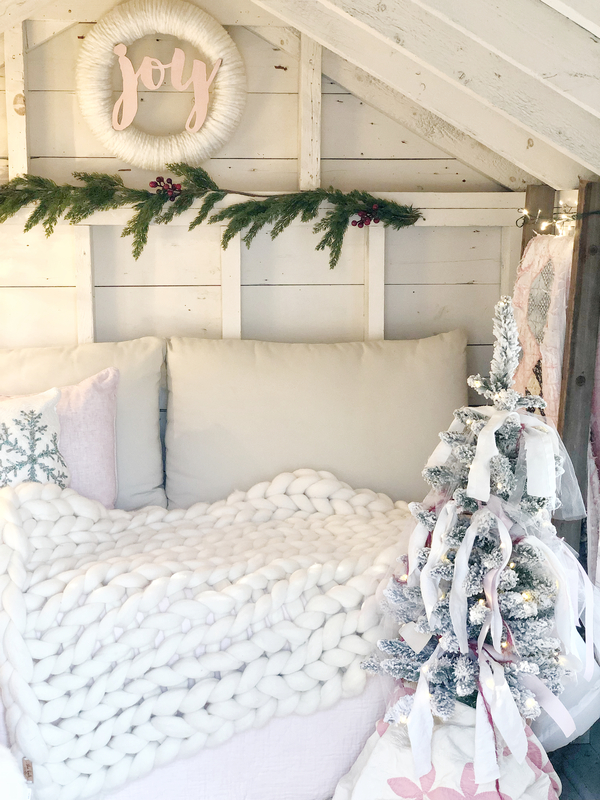 I have 3 of these luxurious blankets from Erin at She Knits Boutique. They add warmth and texture, and are just plain pretty to look at. I added just a few sprinkles of Christmas decor over by my desk. I have had that trio of peppermint trees for lots of years, and they still bring a smile every year when I unbox them. I’m a wine lover, so enjoying a glass in my favorite cozy spot was a must. 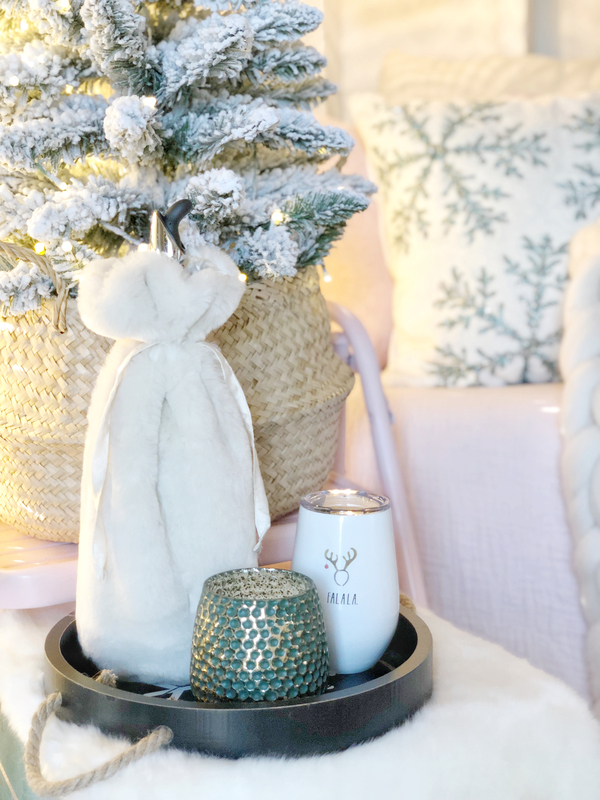 Rae Dunn recently launched an exclusive Christmas collection with Kirklands, and one of my favorite items is this wine tumbler equipped with a lid 😉 Heaven knows I need all the help I can get to NOT spill red wine on that gorgeous chunky throw! 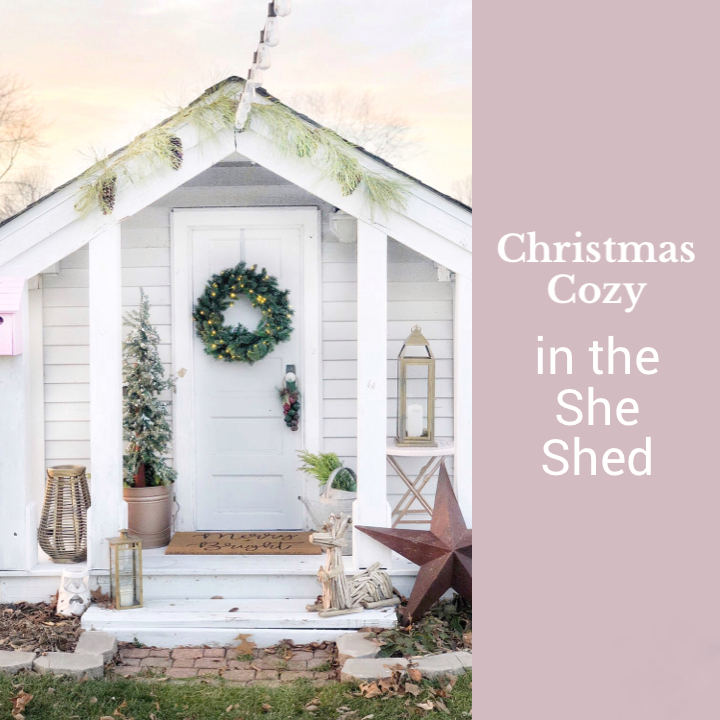 Thank you SO much for stopping by for a tour of Christmas cozy in the She Shed. 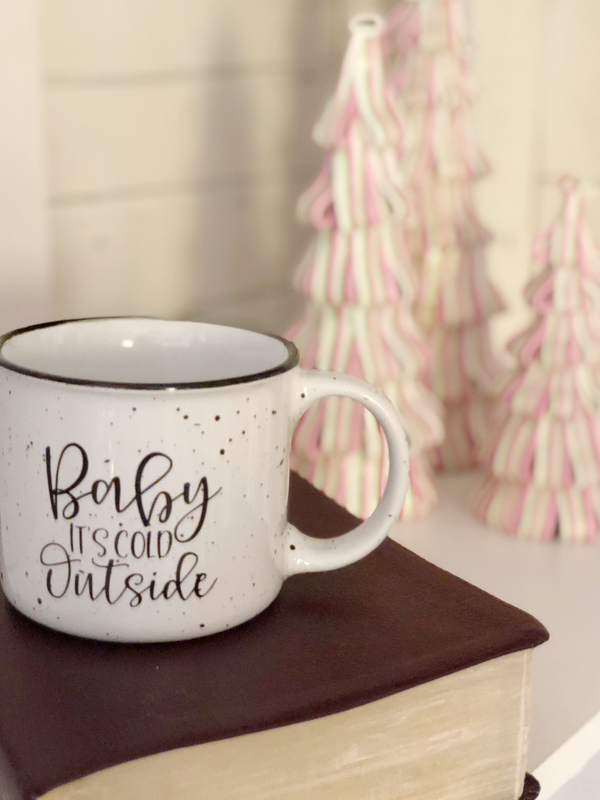 Be sure to visit The Little Green Bean next followed by the bloggers listed below and hop on over to Instagram for another talented group tour over there! 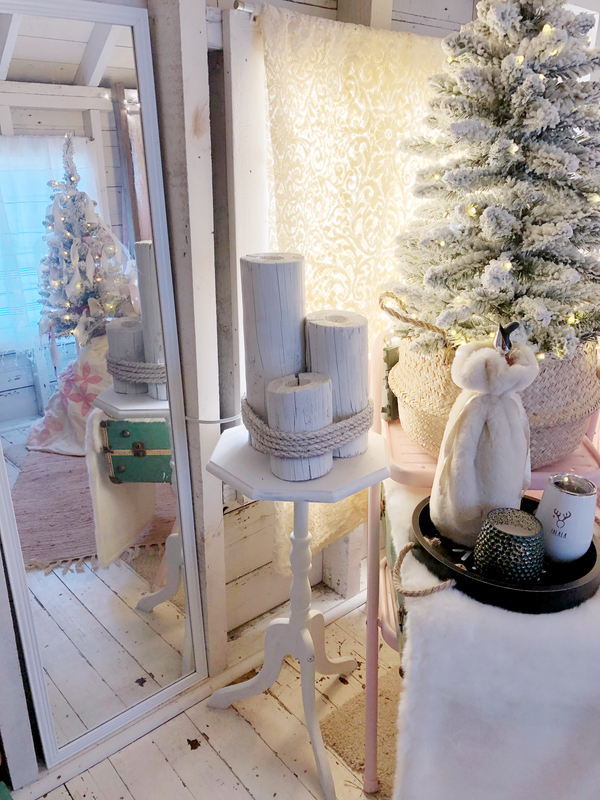 On this important holiday for my family, I want to create comfort and warmth in every corner of our house, because this is the magic atmosphere of Christmas. 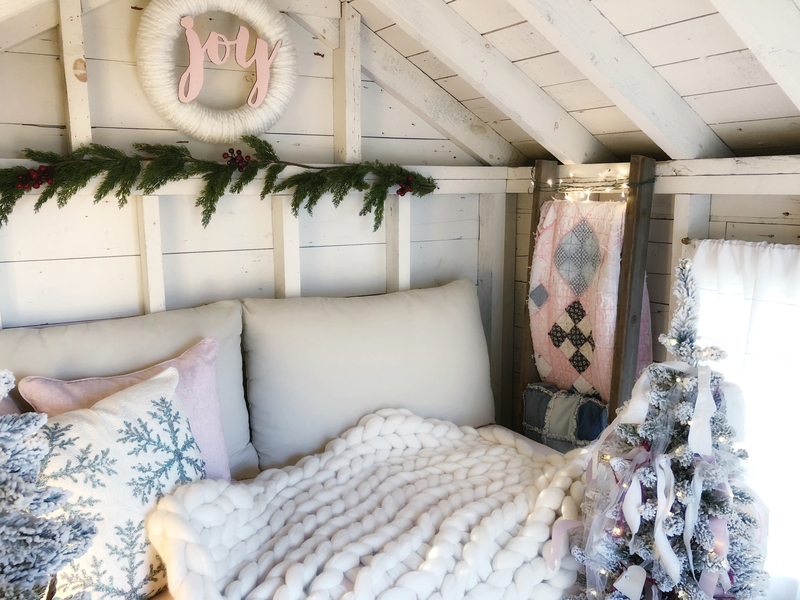 I absolutely love all the things you’ve done to dress up this sweet space for the holidays. You definitely know how to put the “GORG” in “GORGEOUS.” I hope one day I can see it for reals.